Veterinary medicine is an extremely popular career choice in the animal industry, though it requires a challenging, demanding education. It can be difficult to get accepted to vet school, but it can be well worth the effort in the long term. If you are considering attending veterinary school, do your research, as many factors could affect your decision. Options exist that can allow a student to either attend vet school for free or pay off significant chunks of their student loans, but of course, some strings are attached. If you are willing to serve in the Army as a veterinarian, you will receive full tuition while you are in school. The Army also will pay you a $2,000 monthly stipend for incidentals and living expenses (a huge perk for poor vet students!). If you have already graduated before signing up with the Army, there is a loan repayment program that pays up to $120,000 over three years towards student debt. Both active duty and reserve options are available with the Army. For those who have graduated and have student debt, the U.S. Department of Agriculture offers a Veterinary Medical Loan Repayment Program. The program pays up to $25,000 per year for vet students willing to work for three years in an area with a shortage of practitioners. The $75,000 maximum payout can go a long way towards eliminating student loan debt. The Regional Contract Program (RCP) allows students in states without a veterinary program to pursue a veterinary degree at designated out-of-state institutions while paying in-state tuition rates. Spaces in these programs are limited, but veterinary schools do reserve a specific number of seats for vet students from the partner state in return for compensation. For instance, Kentucky lacks a veterinary college but contracts with Alabama’s Auburn University to reserve 34 spots each year for Kentucky vet students. It is true that most vet school applicants are in their early 20s (about 73 percent), but a significant portion is in the 25- to 30-year-old age group (about 16 percent) and another 4 percent are 31 or older. Many major vet schools post the age ranges of their students online. The 2019 class at U.C. Davis, for example, has students as old as 42. The University of Minnesota’s class of 2019 has students as old as 44. It isn’t common for vet students to be in their 30s or 40s, but it is certainly well within the realm of possibility. So you're never too old to consider vet school. A veterinary degree requires a broad course of study where you learn about all the species you will encounter as a practitioner. You can’t decide “I want to be a horse vet” and then only learn about equine medicine. You will, however, have the chance to focus on your area of interest when choosing your internships and residencies. You can also go on to pursue board certification as a specialist in a particular field. Vet school enrollment statistics show considerably more female students than male. According to data collected by the Association of American Veterinary Medical Colleges (AAVMC), as of 2018, the gender split in veterinary colleges is about 80 percent female, 20 percent male. This growing gender gap is also being reflected in the pool of practicing veterinarians. In 2017, the AVMA found that there were 110,393 vets in practice, with 66,731 female practitioners and 43,662 male practitioners. Veterinary medicine is no longer a male-dominated profession, though men do still hold a majority in specific fields (such as food animal medicine, where men hold 80 percent of positions). 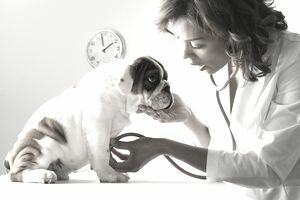 As of early 2019, 30 U.S. veterinary programs have been accredited by the American Veterinary Medical Association. This list includes two newer additions: Midwestern University in Arizona and Lincoln Memorial University in Tennessee both opened their doors in 2014. Another veterinary program, established at the University of Arizona, is actively seeking AVMA approval. According to the American Association of Veterinary Medical Colleges, the average annual tuition is about $52,000 for out of state students and $31,000 for in-state students as of early 2019. Since vet school tuition is expensive, many students to take out substantial student loans. This problem is compounded by the fact that vet students are often unable to bring in any income during their education because of the long hours of study required. According to the AVMA, almost half of the vet students reported having total debt of more than $150,000 at graduation. A 2011 Kansas State University study found that a third of vet students showed symptoms of depression in their first year of study, and the rate of depression only grew in the second and third year of vet school. In comparison, depression is only seen in a quarter of medical students who study humans. There are international schools accredited by the American Veterinary Medical Association, and graduates of those schools do not face any additional hassles to practice in the United States. Graduates of non-accredited schools must deal with expenses and testing before they can become eligible to seek a license to practice in the United States. It can take several months or more to fulfill the equivalency requirements. Two equivalency exams can make a graduate of a non-accredited program eligible for U.S. licensing procedures: the Program for the Assessment of Veterinary Education Equivalence (PAVE) and the Educational Commission for Foreign Veterinary Graduates (ECFVG) certification program.